11-year-old Fritz Reynolds recalled his father telling him that man is the only creature who can find amusement in killing. Little did he realize that those words would become the theme for his teenage years growing up in the rural hamlet of Linden, New York. In this coming-of-age story, Fritz takes us back to a simpler time when neighbors gathered at the general store to listen to radio shows, drank barrel-aged cider, and worshiped at the Baptist church every Sunday. All was picturesque in his close-knit farming community until terror was unleashed on them. Gotta love a good mystery especially a murder mystery in a small town in the middle of nowhere. This story follows Fritz who sees a murder happen before his very eyes however he couldn't identify the killer so there was no reason to say anything so he didn't. He kept it to himself. Years pass and Fritz and the town tried to forget that horrible murder. Well...the past repeats itself and murders start haunting the town again. This was a good mystery...I was completely in the dark and I had no idea what was going to happen. Yes, this was a true story, but I had no knowledge on this so I was along for the ride. I felt bad for the little town because it is scary to have people you know slaughtered and you have NO idea who did or even why. Scary stuff. I really felt for Fritz that he kept such a dark secret for so long. I think he should've said something. MAYBE he could've helped. IDK. But yes, I get that he was a little kid and was scared to say somthing. But yes, this was a fun read. I really enjoyed it. There were some parts that seemed to drag on and on, but those slow parts were worth it in the end. I do wish we had more of a closing in the end. But sometimes life doesn't end with a little bow on top. If you need a good mystery, this is a good one for you to check out especially since it based off of a real one so it makes it even better. I should do some research and learn about the real deal. Poor Fritz! Poor little town! Poor murder victims...but so good overall. I'll stamp this with 4 stars. It sounds nice and I love a good mystery! I loved this book! I thought Suzanne did a great job of recreating these scary events. I can't imagine living in a small town like that and not knowing who the murderer is. Creepy...but fun! 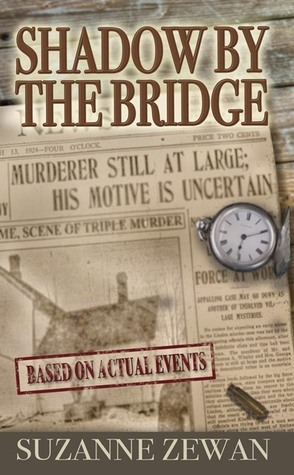 Thanks for reviewing Shadow by the Bridge! B, yesss not the most exciting cover.